Last September I made matching bed covers for Keli and Penny from a doggie themed denim fabric printed with bones and pawprints. 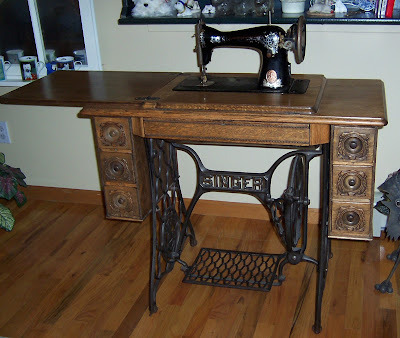 At the time, their matching black wire crates were located upstairs in our bedroom. 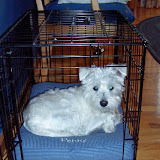 We had zippered Port-A-Crates for them to sleep in downstairs in the kitchen during the day or when we are away from home. Our little escape artist, Penny, discovered that she could push through the zipper to get out of the Port-A-Crate, so we've swapped locations and the wire crates are now in the dining room. We still zip it up at night so she doesn't wander in the middle of the night, and she doesn't dare push through the zipper while we are in the same room. I don't know what we would do if she ever discovers how to escape from the wire crate. 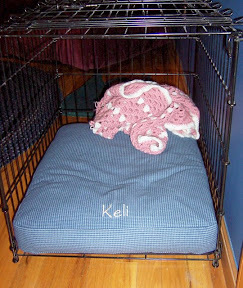 I made both of those denim covers the same size without realizing that Penny's crate is two inches narrower than Keli's crate, so although her bed fits, it's a little squishy when its all tucked inside. These were constructed exactly the same way as the first set, adjusted for the difference in crate width. 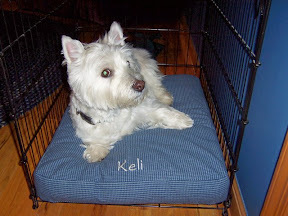 I embroidered their names on each, to make it easier to tell which crate the bed will fit inside. The fabric is yet another blue home dec fabric from my stash (I still have another yard or two of the same pattern). It's a nice change for spring. Be happy that Penny pushes open her zipper. 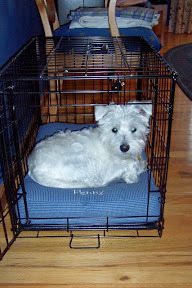 My Westie, Colette, chewed through the zipper of her Sherpa carrier the very first time she was in it! 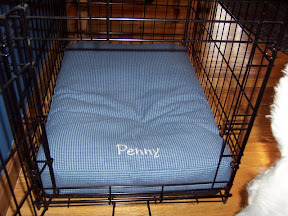 Lucky for Penny, the port-a-crate is still functional; but she has chewed and destroyed a few other things - a vacuum brush attachment, my swiffer duster and a t-shirt pattern come to mind . . . so far nothing too expensive or irreplaceable. 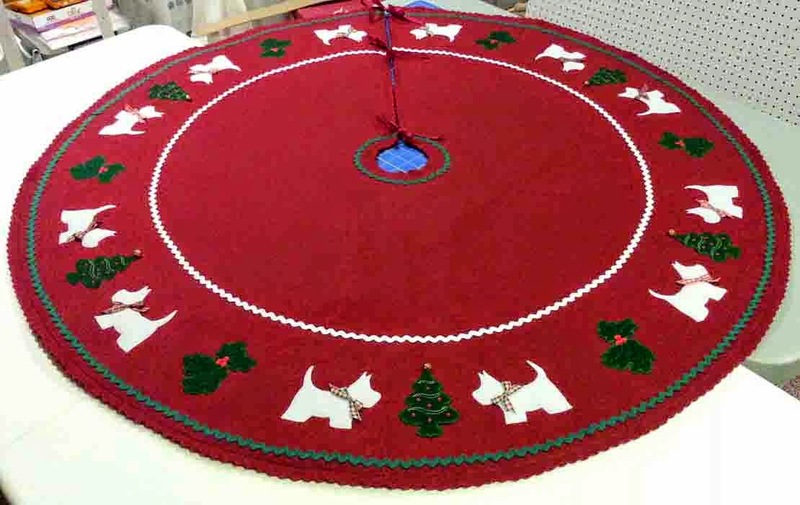 Ah, puppyhood . . .